New York, NY. Temple Beth El. Brunner & Tryon, archs. (1891). Demolished 1947. 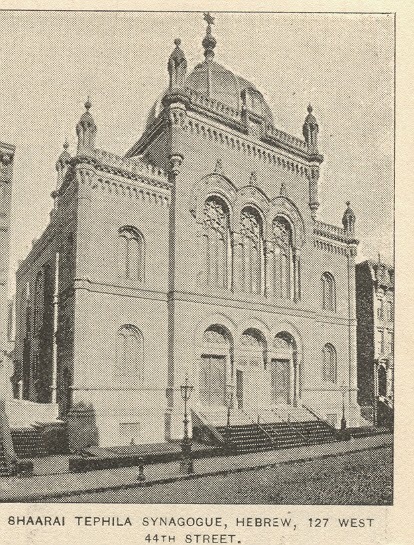 When I recently gave a lecture at the center for Jewish History on the synagogues of New York I showed in passing an image of the former Temple Beth El, designed by Brunner & Tryon and built in 1891 on Fifth Avenue at 76th Street. The impressive building, described in the New York Times at the time of its opening as ""magnificently decorated," was demolished in 1947. After the lecture, I was asked "what was that big thing on the front of the building?" That "thing" seems strange to use today because most of the 19th and early 20th century examples of this synagogue element have been destroyed. 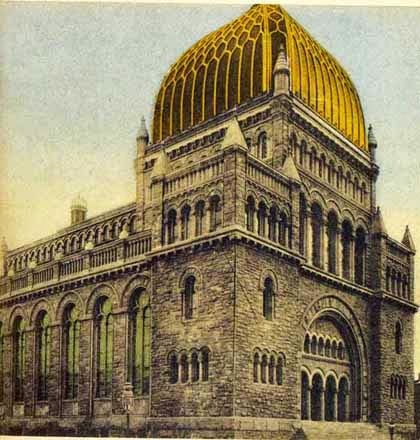 In the words of architectural historian Rachel Wischnitzer, that element at Beth El was a "large, hipped, axial dome, tied to the front part of the basilican structure and covered with a ribbed and patterned, gilded decoration." The feature joined two disparate forms from the well-known contemporary architectural language. 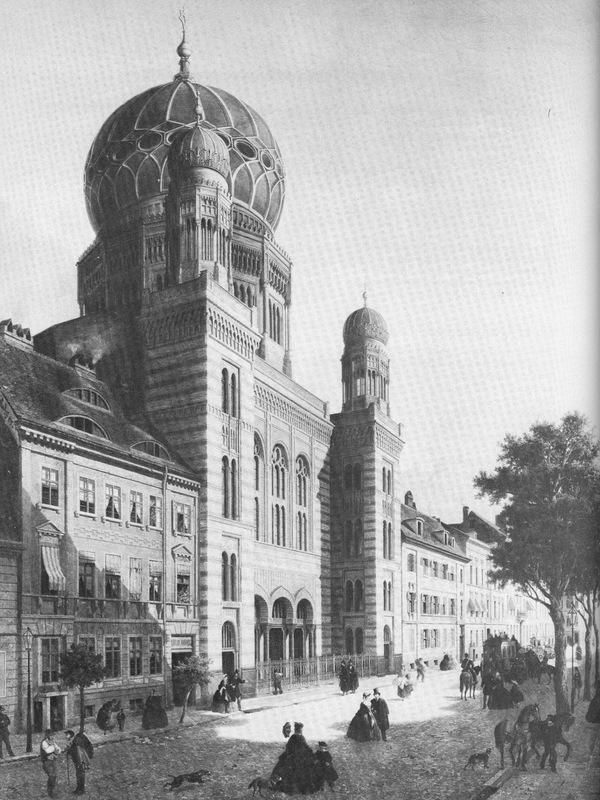 Thus, what was essentially a tall French Empire Mansard-style dome was given orientalizing (or Moorish) decoration recalling, in its patterned ribbing, the Oranienburgerstrasse Synagogue of Berlin. By 1891 the once strange Oriental or Moorish style was now fully accepted and widely understood as a "Jewish" style - whatever its origins. Berlin, Germany. Oranienburgerstrasse Synagogue. Eduard Knoblach, arch. (1859-66). This facade dome seems strange to us today, but a hundred years ago, beginning with the attention paid to the Oranienburgerstrasse Synagogue in Berlin, it was one of many familiar branding devices used by synagogue architects. Though sometimes domed facades could be found on secular buildings, this form was rarely used for churches, which might have a central facade tower as in the tradition of Christopher Wren, but never a tower with a dome. So this striking form can almost be called a synagogue device. Jelgava, Latvia. Great Synagogue. 1860? I thought it would be interesting to take a look at some of the predecessors of Beth El, and how the form continues into the early 20th century. 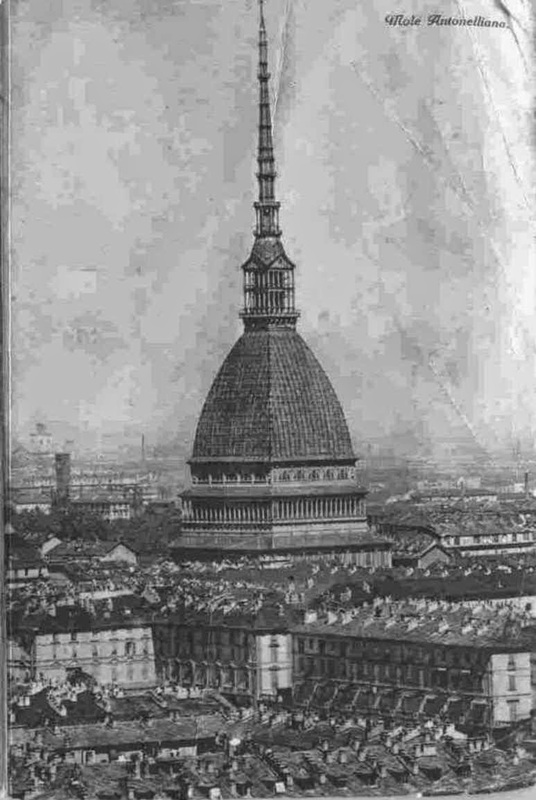 The tall hipped dome, often called a French Dome, was first used in synagogue architecture by the Italian architect and engineer Alessandro Antonelli for the synagogue of Torino (Turin), Italy, which came to be known as the Mole Antonelliana, begun in 1863 and finished only in 1889. 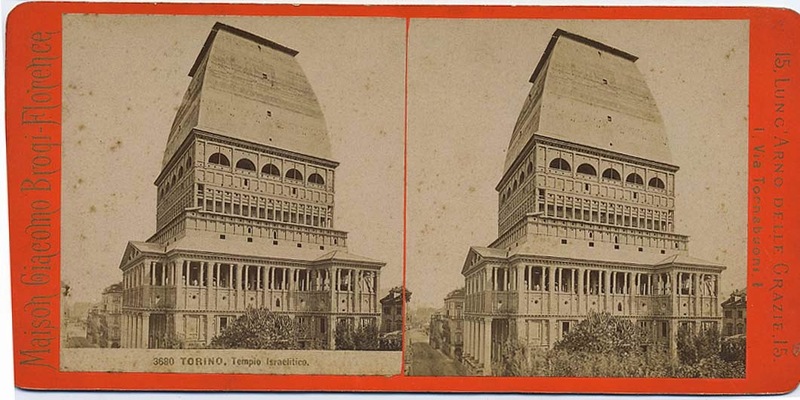 Though started as a synagogue, the Torino Jewish Community sold the building to the city in 1876 as height and costs soared. The community had previously halted construction, but not before erected an exceptionally tall hipped roof, a version of which was incorporated into finished building. 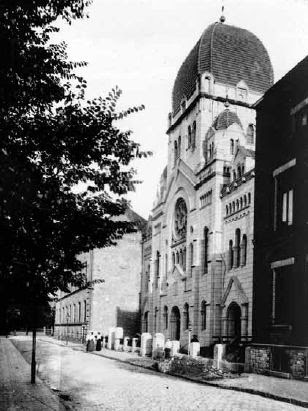 Brunner had traveled widely in Germany and was familiar with publications about synagogues, so he certainly was familiar with the Oranienburgerstrasse Synagogue. He would have known - at least from pictures - the Mole Antonelliana, too. There were, however, two more immediate sources for the Beth El dome, one in New York and one in Chicago, and both designed by Jewish architects. New York architect Henry Fernbach, for whom Arnold Brunner had worked while still a teenager, designed the new Shaaray Tefilah Synagogue on West 44th Street, which opened in 1869. At that time Shaaray Tefila was nominally Orthodox, though during the next decade the congregation modified its service and identified more with the nascent Reform Movement. This was almost certainly Brunner's own congregation. His grandfather Barnet Solomon was president of the congregation when the new synagogue was built, and presumably this is where young Arnold would have received his religious training and celebrated his Bar Mitzvah in 1870. 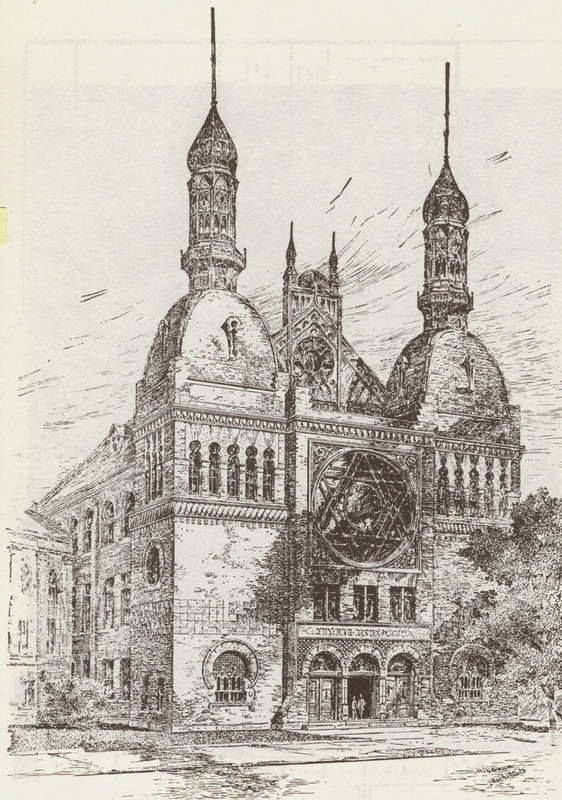 In many ways Brunner's Beth El recalls Fernbach's design, especially in the disposition of the facade and the placement of a large dome over the central entrance. This dome was multi-partite and seems to have been decorated with stars on its outer shell. New York, NY. Congregation Shaaray Tefila, 127 West 44th Street. Henry Fernbach, arch. (1869). Photo: Moses King, King’s Handbook to New York. Boston: Moses King, 1893 (2nd edition), 403. 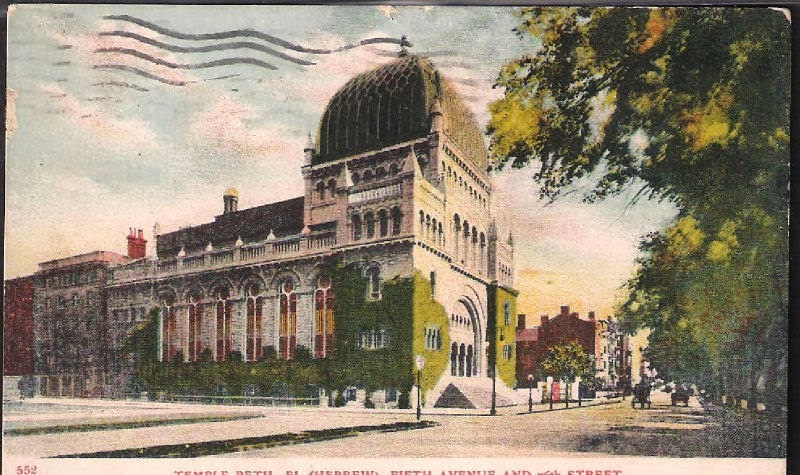 A few years later in Chicago, one of the first distinctive synagogues in the city, Sinai Temple, was designed by Dankmar Adler and Edward Burling. The congregation held a competition and Adler and Burling won over four other architectural firms. Adler's Jewish credentials may have helped win the commission, which he executed with the help of John H. Edelmann, possibly assisted by young Louis Sullivan. The interior stenciled wall decoration is said to have been developed by Sullivan.Typically throughout his career Adler was most interested in structural, engineering, material and acoustic problems and left much of the decoration of this buildings to others. Sinai Temple was built in 1875 at the corner of Indiana Avenue and 21stStreet, as part of the post-fire rebuilding of the city. The new structure combined mostly Romanesque detailing with distinctive French Second Empire elements, most notably a projecting central façade pavilion topped by a tall square dome surmounted by a hipped Mansard roof flanked by lower towers with similar domes. Adler was an engineer and his design is probably tied directly to the example in Torino, a program like the Eiffel Tower, much watched in the engineering profession. For more on Adler see my earlier post here. The experience of Fernbach's Shaarey Tefila combined with Adler's innovative dome surely inspired Brunner. In 1884, Adler & Sullivan designed side galleries for the auditorium and in 1891 the firm totally remodeled and expanded the building, so that little of the original interior remained, but the distinctive facade dome was left as before. Chicago, Illinois. Zion Temple, original design. Dankmar Adler, arch. (1884). Illustrated in Gregersen, Dankmar Adler (1990), fig 41. In the early 1880s Adler & Sullivan designed Chicago's Zion Temple dedicated on September 5, 1885. This original design drew more directly from the Mole Antonelliana, since tall towers were affixed to the top of not one, but two, towers, with hipped Mansard domes. In the end, however, the towers were not built. The congregation probably did not want to bear the extra cost and suffer as did the Italian congregation. Adler scholar Charles E. Gregerson writes "Although the original design of the front with its twin onion-domed towers would have made the building somewhat monumental, the omission of these features in the completed building gave it a stumpy appearance that Sullivan's crude Moorish-inspired details only accentuated." [Charles E. Gregerson, Dankmar Adler: His Theaters and Auditoriums, with a biography of Dankmar Adler prepared in collaboration with Joan W. Saltzstein. (Athens, Ohio: Swallow Press/Ohio University Press, 1990), p 62-3]. Port Gibson, Mississippi. Synagogue. Photo: David Abramson. 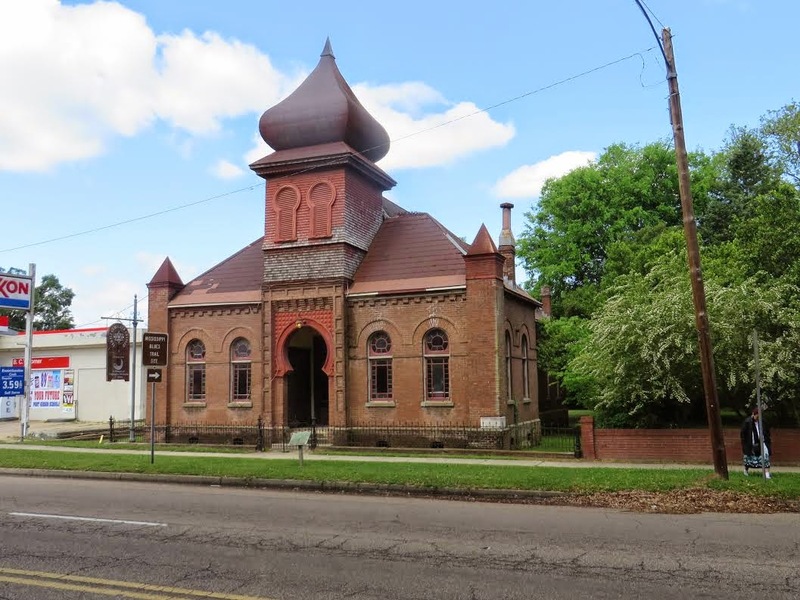 A variation on the theme can be seen in the lovely little Moorish style Temple Gemiluth Chassed, designed by architects Bartlett & Budemeyer, and built in Port Gibson, Mississippi, built in 1891-92, almost exactly contemporary with Brunner's Temple Beth El. In the early 20th century there were many examples and variations of the central square facade dome in European synagogues. All the European synagogues of this type have not been identified, but a quick survey (in my image collection) shows examples from Poland (Czestochowa, 1899-1909), Germany (Osnabrück, 1906) and Russia (Samara, 1908). This may be an unusual case of reverse influence, with the impetus for the square facade domes coming from America. But there were already centrally placed domes on square towers in Europe, too, such as that on the Tlomackie Street Synagogue in Warsaw, built by Italian architect Leandro Marconi, in 1874-1878. Warsaw, Poland. Tlomackie Street Synagogue, Leandro Marconi, arch. (1874-1878). Czestochowa, Poland. 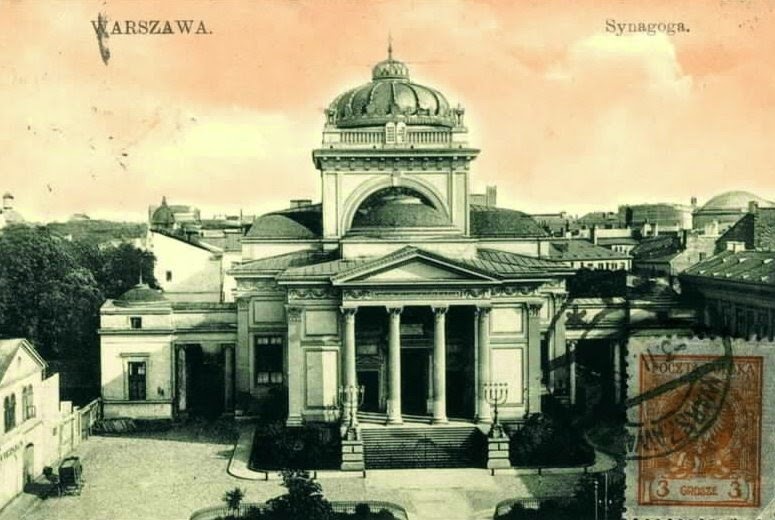 Former synagogue, built 1899-1909, destroyed 1939. 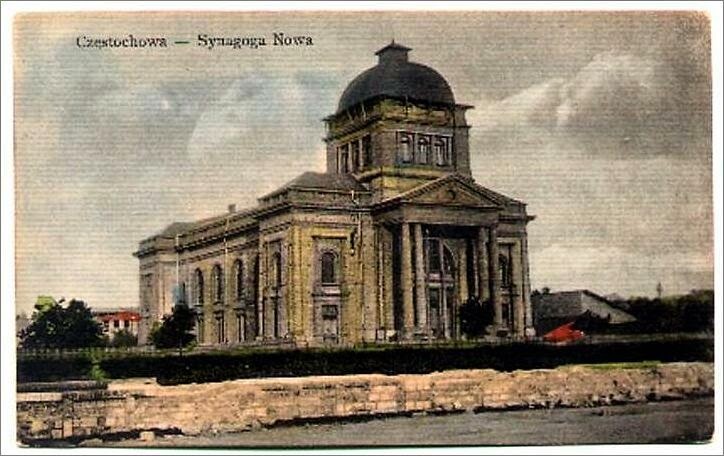 If you know of other examples of similar synagogues with facade domes, please let me know.